My question is, who is the Wisdom described here? It seems that God created this being and it was present with Him before creation time began? I'm looking for a Catholic perspective. We can also point to the implicit connection made between Proverbs 8 and Christ in Aquinas, Summa, First Part, 46.1. Thus we see that, in addition to other ancient and modern thinkers, some of the most respected theologians in Catholicism (Ambrose, Athanasius, Bede, and Aquinas are all Doctors of the Church), considered "Wisdom" of Proverbs 8:22ff. as referring to Christ. St.Louis De Montfort Book on the "Love of Eternal Wisdom" provides a clear path to determine who is the Wisdom spoken by Solomon in Proverbs8. St.Montfort distinguised Wisdom as Natural and Supernatural, and from the Supernatural he divides it further into to two which is the Created Wisdom and Uncreated Wisdom. The Uncreated Wisdom St.Montfort teaches as the Incarnate Word, the LOGOS and it is Jesus Christ. Natural wisdom is the knowledge, in an outstanding degree, of natural things in their principles. Supernatural wisdom is knowledge of supernatural and divine things in their origin. This supernatural wisdom is divided into substantial or uncreated Wisdom, and accidental or created wisdom. Accidental or created wisdom is the communication that uncreated Wisdom makes of himself to mankind. In other words, it is the gift of wisdom. Substantial or uncreated Wisdom is the Son of God, the second person of the most Blessed Trinity. In other words, it is eternal Wisdom in eternity or Jesus Christ in time. Let's look & examine the wordings of St.Montfort on the Created Wisdom and how he defined it. Accidental or created wisdom is the communication that Uncreated Wisdom makes of himself to mankind. In other words, it is the gift of wisdom. "Created Wisdom is the communication of Jesus Christ makes of himself to mankind.In other words, the Created Wisdom is the gift of Wisdom. Therefore, the Created Wisdom from St.Montfort, Jesus "makes it" to communicate Himself to mankind. Understanding it more deeply, it means Created Wisdom is a gift to all believers in understanding the revelation of who Jesus is.In case of Solomon in Proverbs8:22-36 he is not asking for the revelation of the Saviour, he is asking for the gift of wisdom to govern his people. The gift of wisdom/Created Wisdom became parallel to Christ Anointing which is the Holy Spirit himself but the revelation/operative in fullness is revealed from glory to glory, meaning gradually as Jesus advances to fulfill His mission. In this understanding Created Wisdom, from Solomon to Jesus time is also revealed in the fullness gradually as the description of Wisdom is the personification of Jesus and the manifestation of the Holy Spirit. Jesus Christ lived the "gift of wisdom" in full as He is the source of Wisdom and cosubstantial and united to the Holy Spirit. But we know that the Created Wisdom is like a full & perfect reflection of Jesus Christ the Uncreated Wisdom. If we can answer who is the full and perfect reflection of Jesus Christ then we can discover who is the Created Wisdom or the gift of wisdom according to St.Montfort. From the Catholic Church Teaching it teaches St.Augustine belief by calling Mary as the "Seat of Wisdom", And this teaching is affirmed in CCC721. 721 Mary, the all-holy ever-virgin Mother of God, is the masterwork of the mission of the Son and the Spirit in the fullness of time. For the first time in the plan of salvation and because his Spirit had prepared her, the Father found the dwelling place where his Son and his Spirit could dwell among men. In this sense the Church's Tradition has often read the most beautiful texts on wisdom in relation to Mary. Mary is acclaimed and represented in the liturgy as the "Seat of Wisdom." In CCC721, we can see that Mary was described as the "dwelling place of the Son" and also the "dwelling place of the Holy Spirit" and even among men. Now were getting clearer, Mary is the "Seat of Wisdom" as CCC721 teaches. And Mary became the fitting description of the full & perfect reflection of Jesus Christ and the manifestation of the Love & Mercy of the Holy Spirit. The question is, is the Catholic Church teaches that "Mary is the perfect personification and manifestation of the Holy Spirit? Going back to Wisdom in Proverbs8, the answer to this can be clearly seen from Solomon Prayer in Wisdom9:1-4 gives a good details of what Solomon is asking God to give him. What kind of Wisdom did Solomon ask in Wisdom9:1-4? Let's examine the difference of the Wisdom that Solomon asked God and the Wisdom that the Catholic Church teaches in CCC721. "Solomon said "give me the wisdom that sits by your throne,"
We can see Solomon a King is asking a Wisdom to govern his people as King., and this Wisdom according to Solomon is Created and emanates from God as the source of Wisdom and this Created Wisdom is a "spirit that sits on God's throne"
Now, in contrast Mary's prayer was a totally different one, the handmaid of the Lord is asking God to grant the prayers of His people to send them a Savior. Mary was not praying for Created Wisdom, Mary is asking for the Uncreated Wisdom to come the LOGOS our Savior Jesus Christ. And Mary being the handmaid is asking for the "King of Kings and the Lord of Lords to come", She is not after for the Wisdom in Proverbs8:22 that King Solomon asked. So to answer who is the Wisdom in Proverbs8:22 that Solomon prayed for and asked God? Clearly King Solomon was not asking for the Logos/Uncreated Wisdom but a Created Wisdom a gift of Wisdom to govern his people as King of Israel. Solomon describes Wisdom as a Mother, Teacher, Consoler,Comforter and a Prophet. All this is the manifestation too of the "Advocate,Paraclete,Helper,Spirit of Truth" in John gospel. And since spirit of Created Wisdom existed before the creation began. There is only one creature "a soul of a Mother" who existed too before the creation time began, She existed in eternity as a Divine Thought "Chosen to be the Theotokos" and the Cathecism of the Catholic Church teaches this doctrine as an article of faith. For added biblical support; aside from the Most Holy Trinity in the Book of Genesis before creation time begin in Genesis1:3 "LET THERE BE LIGHT". One school of thought on this verse supported Colossians1:16, because this passage can be interpreted as the earth was empty & void because everything is created for Him/Jesus and in Him.Jesus must be created first. And so this passage is composed, of the Holy Spirit forming Jesus/Logos into the waters of the Womb of Mary. (this is not only my reflections I saw this in one of CSE thread question and expound it deeper by relating it to Colossians). Catholic official teaching in Catechism states, Mary was chosen in eternity and existed in the Divine thought. Therefore, if we embraced the combined reflections and narration of Wisdom in Proverbs, Sirach, Ecclesiates,Psalm, Book of Wisdom, etc. we can see that the passages pertains to a Created Wisdom one that is on the side of the Almighty God watching how He created everything and in time became the instrument of God revelation of his Divine Plan for man's salvation. In eternity God desires to share His goodness by creating mankind. In eternity God the Father begotten His only beloved Son. In eternity, after God begotten His beloved Son co-substantial and One with Him, the Begotten Son dreamed of a Mother in eternity. The Begotten Son, "begots" and "created" an image of Her Mother in eternity. In eternity the Holy Spirit chosen the the Dreamed Mother to be Her Spouse. In this sense the Church's Tradition has often read the most beautiful texts on wisdom in relation to Mary. Mary is acclaimed and represented in the liturgy as the "Seat of Wisdom." In closing, Solomon was given the gift of wisdom to govern but it does not pertains to the Saviour Jesus Christ.While Mary She became the "Seat of Wisdom". 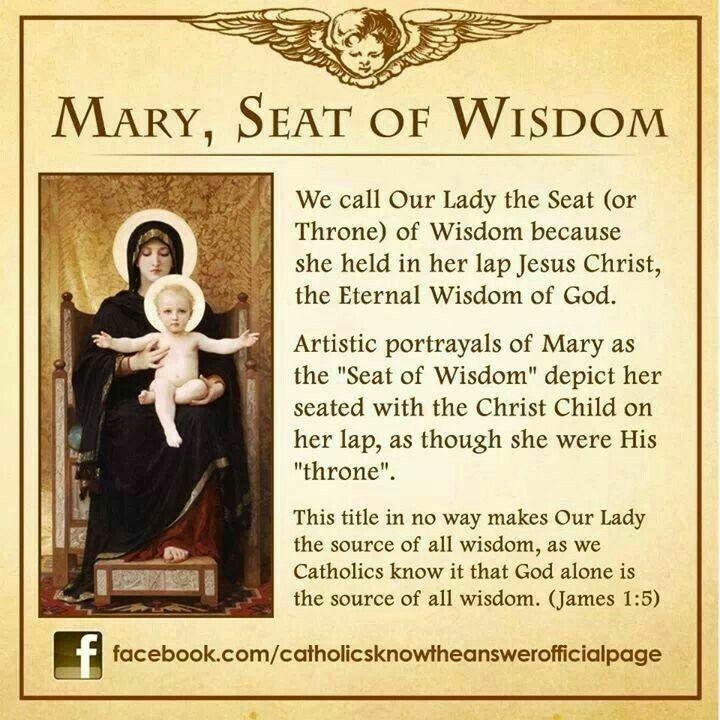 Now, how can we reconcile Mary depicted in the image as the "Seat of Wisdom", if Jesus is Wisdom? In the image, the Wisdom Jesus Christ does not sits on the Throne, rather Jesus sits on Mary's lap and so Mary is the one sitting on the Throne. As Mary's Seven Sorrows merited the full & perfect dwelling place to house the Sevenfold Gifts of the Holy Spirit and upon entering into Heavenly Glories was crowned "Sovereign Queen of Heaven & Earth". WISDOM is the Cross and the Cross is WISDOM. Is Wisdom created? YES!, if Wisdom is created it is not Jesus nor the Holy Spirit. Is Wisdom a a created Spirit? Yes!, it is the spirit that sits on God Throne as Solomon described in his prayer. Is the spirit of created Wisdom comes as a form of Anointing?Yes, St.Montfort teaches that Wisdom is the gift of the Holy Spirit. The most direct way of linking the Wisdom to Mary is the title Mother of the Eucharist, Why? Proverbs9:1-6 describes the Wisdom had prepared a house or a Church with a strong foundation of Seven Columns/Pillars and calling everyone to celebrate a Feast and eat the meat and wine that had been prepare at the table for them to have life. she has dressed her meat, mixed her wine, yes, she has spread her table. she says, Come, eat of my food, and drink of the wine I have mixed! she has dressed her meat, mixed her wine, yes, she has spread her table...and she says, Come, eat of my food, and drink of the wine I have mixed! Does this words pre-figured the Holy Eucharist that the Wisdom of the Holy Spirit had prepared and sanctified? And where does the Holy Eucharist comes from? It comes from the Blessed Virgin Mary's Pure & Immaculate Flesh. This articles titled "Mary and the Eucharist" reflected on Mary in comparison to the monstrance that hold the Holy Eucharist as the Pure Womb of Mary. On this day, I was presented with a monstrance I had never seen before. It opened up for me the mystery of Mary symbolically and visually in a way I had never experienced. The monstrance was an Image of Our Lady and the Divine Host was positioned within her womb. The message was profound. The Jesus who is truly present in the Holy Eucharist is the same Jesus who lived in the womb of that Holy Virgin for nine months. Jesus told the disciples, "Amen, amen, I say to you, unless you eat the flesh of the Son of Man and drink his blood, you do not have life within you" (John 6:53 ff). We who receive the bread of angels, who have been invited to the Eucharistic Feast, now have His Divine life within us. We spiritually bring Christ into a world waiting to be reborn. We are called to become living monstrances, repositories of the Bread of life for others. Mary is the model who shows us the way. How about the Seven Columns, what does it pertains? In summary, we might say that the seven pillars of wisdom are (1) counsel, (2) knowledge, (3) understanding, (4) might or strength, (5) power or authority, (6) riches and (7) honor. These are seven characteristics of wisdom. Proverbs 8:14, "Counsel is mine and sound the wisdom"
Proverbs 8:12, "Wisdom dwells with prudence and finds out knowledge." Proverbs 8:14B, "I am understanding, power is mine." Proverbs 8:18, "Riches and honor are with me." Proverbs 14:24, "The crown of the wise is their riches." Proverbs 15:23, "The reverential fear of YHWH is the instruction of wisdom. And before honor is humility." The Seven Columns or Seven Pillars correspond to the Sevenfold Gifts of the Holy Spirit. The succeeding verse in Proverbs9:1-6 speaks of "she has dressed her meat, mixed her wine, yes, she has spread her table" is a pre-figurement of the Holy Eucharist prepared by the Holy Spirit together with the Lady Wisdom as Wisdom is personified as a Woman. "Mercy is the flower of Love, in Love it is conceived and in deeds it is revealed". How can this simple phrase reveals the identification of the Wisdom and mystery behind Proverbs8:22-23? The Wisdom in Proverbs8:22 is a "Created Spirit" that sits on God's Throne as Solomon stated in his prayer in the Book of Wisdom; "give me Wisdom that sits on God's Throne"
This takes a deep meditation on how God immediately created a soul at the moment of conception as Catholic Church teaches in CCC366. The question is, when God the Father and the Begotten Son conceived a Love for the chosen Woman in eternity before the creation time begins, what is immediately produced or created? It cannot be a soul as soul not glorified cannot enter the Glorious Presence of God in eternity.What God immediately produced or created is a "spirit" the "Spirit of Created Wisdom" that God decreed to be the Anointing of Mary's soul as the Created Immaculate Conception. Two names given by God the Father in Heaven the Holy Name of Jesus & Mary. Jesus anointing was the Holy Spirit while Mary's anointing is the "spirit of Created Wisdom". The "spirit of Created Wisdom" is the spirit who witness God's creation in the beginning and knows the Divine Plan of God from alpha to omega. Not the answer you're looking for? Browse other questions tagged catholicism exegesis proverbs wisdom or ask your own question. According to Catholicism, what does 'come upon thee' and 'overshadow thee' mean? Who is the author referred to in the Pope's 4 April 2014 homily? In Calvinism, is there any correlation with the elect and the “blessed” in the Beatitudes of Matthew 5?